Reduce wasted drug products paid for by patients and improve satisfaction upon discharge by sending costly multidose meds home for continued use! 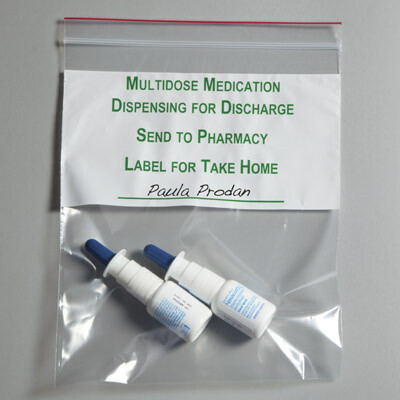 Use this Clear preprinted Dispensing for Discharge bag to send multidose meds to the hospital pharmacy for repackaging and outpatient labeling. The newly labeled package is then given to the patient upon discharge for use at home. Continued use of outpatient drugs at home eliminates the need for a prescription that must be picked up at the local pharmacy and requires additional patient spending. Reclosable, single-track, 2-mil thick bag with White Easy-Write area is preprinted with the message “Multidose Medication Dispensing for Discharge/ Send to Pharmacy/ Label for Take Home” in Green. Contact Customer Service for detailed information about our custom printed bag capabilities available in a variety of colors, sizes, styles and text of your choice. We offer low minimum orders, fast shipping and free samples.